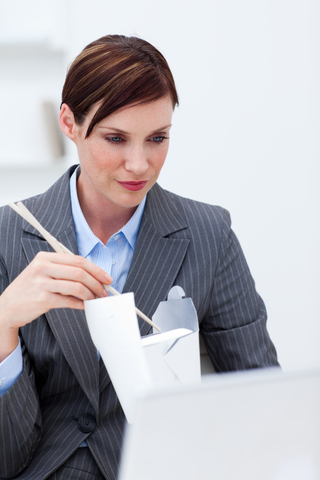 Share the post "How To Eat Well At The Office"
Sometimes it’s hard to break away from your work and go eat a decent lunch. Grabbing fast food or popping a frozen dinner in the microwave are not your only (or best) choices. You can take delicious and healthy food to work for lunch without a lot of effort. Wraps – the possibilities are endless. Choose from turkey, ham, roast beef and put in a tortilla with veggies, cheese and your favorite condiments. You can even do an all veggie wrap, which is delicious with hummus. Try new combinations. You may just find a new favorite. Salad – have fun with the variety and types of greens you use. Don’t get stuck in an iceberg lettuce rut (it’s the least nutrient dense leafy green available). Top with a variety of veggies and some protein like grilled chicken or hardboiled eggs. Bring dressing on the side so your salad doesn’t get soggy. Leftovers – leftovers are a great way to eat well at work. You can rework them into a new meal (like adding last night’s chicken to your salad) or eat them as they are (meatloaf and green beans). You can cook extra during the week to ensure you have some to take to work. Snacks – You might be surprised by how filling a combination of snack-type foods can be when eaten all together as a meal. Have some veggies with hummus, a hardboiled egg and an apple and you’ll likely be filled up. Cook Once – Prepare a few meals and freeze in individual portions. You can spend just a couple of days each month doing this and have a variety of meals to choose from in your freezer. Lasagna, soups, meatballs, enchiladas, casseroles, meat and veggies – can all be popped in the office microwave and reheated. The most important tool to eating well at work is a plan. Take time to figure out what you want to keep at work and what you want to bring with you. Spend one day each week prepping food (such as slicing fruits and veggies) and portioning them out. Plan out your meals ahead of time (even if you are planning to bring leftovers) and portion out any food that you can in advance. Taking a little time at the beginning of each week makes it so you have great food ready to grab and go on your way to work each day.